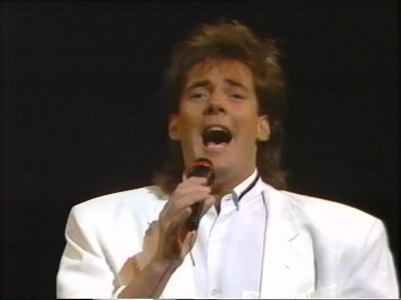 The Eurovision Song Contest 1988 was the 33rd Eurovision Song Contest and was held on April 30 1988 in Dublin. The presenters were Pat Kenny and Michelle Rocca. Future international superstar, the French-Canadian Celine Dion, then only famous in the French-speaking world, was the winner of this Eurovision with the song, Ne partez pas sans moi, composed by Swiss-Turkish composer Atilla Şereftuğ with lyrics by Nella Martinetti. This was the second victory for Switzerland. The first one was in 1956: Refrain, performed by Lys Assia. It was also the last time a song in French won the Contest, the language having dominated the event in earlier years. Radio Telefís Éireann (RTÉ), as the host broadcaster for this edition of the contest, decided that the show's production style needed to be revamped in order to attract and sustain a younger audience. They employed Declan Lowney (who was notable for being a director of music videos and youth programming) as director for this edition, and he would also direct the interval act which included the popular Irish rock group Hothouse Flowers which was filmed in 11 countries around Europe and was the most expensive music video ever produced in Ireland at that time. At the opening of the show, Johnny Logan sang Hold me now. The traditional scoreboard was replaced with 2 giant Vidiwalls located on either side of the stage, which also projected live images of the performers from the green room, and a new computer-generated scoreboard was used. The stage itself, conceived by Paula Farrell under chief production designer Michael Grogan, was also the largest and most elaborate ever constructed for a Eurovision. To compensate for the fact that the vast stage took up most of the room in what is really an average size exhibition hall, the Director deliberately darkened the hall where the audience was located and refused to use wide angled shots of the audience, in order to create the illusion of the venue being bigger than it actually was. Cyprus was drawn second to compete in Dublin and had selected the song 'Thimame' sung by Yiannis Dimitrou as their entry. However, at a late stage CyBC decided that the song was ineligible to represent them as it had been entered into the 1984 Cypriot selection, where it had finished in 3rd place. This was classed as a breach of the Cypriot rules of selecting their entry at this time (and an infringement of the Eurovision rules) and so Cyprus withdrew from the 1988 contest. It was quite a last-minute decision as the song was advertised in the Radio Times information about the preview programme of the contest. The song also appears on the Norwegian record release of the 1988 Eurovision Song Contest entries. The 1988 contest is notable for the quirk of the final votes. With three countries left to vote, the UK were well in the lead with 133 points against Switzerland's 118. With the third last country only awarding Switzerland one point, the UK looked certain of victory, as even if Switzerland scooped the two final 12s, the UK would only need to gather 11 points from three juries combined to be unbeatable. However, that country failed to give the UK any points at all and as the following country gave the UK a meagre three points and the maximum 12 to Switzerland, the contest was suddenly blown open. With the conclusion of voting from the penultimate jury, the UK was holding a five-point lead over Switzerland. As the final jury, that of Yugoslavia, began to award its points in the customary ascending order, the international audience held its breath to see how the two rivals for victory would fare. Switzerland were the first to be named with six points, barely enough to keep their hopes of winning alive, edging them as it did into a one-point lead. However, given the pattern of voting all evening, it seemed highly likely that the UK would be given one of the higher set of points. But remarkably, after the seven, eight, ten and twelve points were announced, it transpired that Yugoslavia had awarded the UK no points at all, and Switzerland were left to savour a dramatic triumph. After strong votes all night, the UK only managed to garner a mere three points between the last three juries. Yugoslavia had caused the same situation to happen when after their voting UK lost to Spain by 1 point in 1968. The UK entry was written and composed by Julie Forsyth, the daughter of the entertainer Bruce Forsyth who was present. When interviewed afterwards he was particularly annoyed at the Dutch jury not having given a vote to the UK, as they had done some work there. Six artists returned to the contest this year. Kirsten & Søren represented Denmark in 1984 and 1985 as Hot Eyes, Boulevard reprsented Finland in 1987, Yardena Arazi was one of the presenters of the ESC 1979 and was a member of the Chocolat Menta Mastik who represented Israel in 1976, Dora represented Portugal in 1986, Tommy Körberg represented Sweden in 1969 and the Turkish band MFÖ represented their country in 1985.